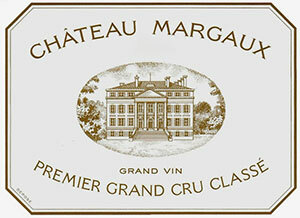 The supple-textured 2004 Chateau Margaux is reminiscent of the 2001 or 1999. It exhibits a superb blue/purple color to the rim as well as sweet aromas of flowers, blueberries, creme de cassis, licorice, and smoke, superb fruit intensity, medium body, classic elegance, and silky, sweet tannin in the long finish. This beauty can be drunk now or cellared for two decades or more. Tasted at Bordeaux Index annual 10-year on tasting from an ex-château bottle. The Château Margaux 2004 has an outstanding graphite-tinged bouquet that has much more vigour than its peers. It just billows from the glass, although you might be fooled into thinking it was a Pauillac. The palate is medium-bodied with fine freshness and structure. This is nothing flash of ostentatious about this First Growth – rather it is neat and tidy, what you might call a "functional" Château Margaux that channels all its effort into tension, mineralite and persistency. In this regard, it is a total success. Tasted March 2014. Dark red, relatively youthful in appearance; still tight and youthfully oaky on the nose; a moderately concentrated middleweight, fresh in acidity and finely tannic; ripely redcurrant in flavour, with a nice concentration for the year, long and vital, still slighty oak dry in texture, but with a clear complexity, a fine length across the palate, and excellent length to finish. Plenty of matter there for the year, but still a touch austere; better in another five years or so.